This study describes a questionnaire survey of interdisciplinary scientists conducting research at The U.S. Environmental Protection Agency (EPA) in Research Triangle Park, North Carolina. The survey was conducted to gain a clearer picture of how the interdisciplinary scientist seeks information, and in particular how the interdisciplinary scientist manages his/her time in regard to information-gathering tasks. Results indicate that many participants have at least some difficulty in keeping up with research in their field(s) of study in regard to time. As a result, many participants do at least some of their information-gathering in their off-time or delegate certain research responsibilities to others. Few studies have been done in recent years to document how the research needs of the interdisciplinary scientist differs from other scientists. There is a small body of literature that addresses the needs of biologists, chemists, physicists and the like but they tend to be discipline based studies, not taking into account the needs of a cross-discipline researcher (Palmer 1996). These studies indicate certain trends within small groups of "pure" researchers, but do not provide a clear picture of how the interdisciplinary scientist functions as an information gatherer. The sciences have exploded in recent years, branching off into innumerable specialties--geochemistry, toxicology, biochemistry are just a few. Many undergraduate and graduate educational programs are now offering majors and minors in concentrations that require an in-depth knowledge of at least two of the major scientific disciplines. More and more, researchers are required to have a command over more than one of the classic disciplines. This presents unique challenges to the researcher and effects the information-seeking behavior of the research scientist. The goal of this research project is to gain a clearer view of how interdisciplinary scientists find and use information. There are some overarching trends that characterize all research scientists. We know that scientists, in general, tend to rely on personal networks for information. Colleagues and graduate students are often consulted as they tend to provide the researcher with timely, high-quality news about current research. Researchers will often consult with many "experts" to gain perspective on how a problem can be solved. (Palmer 1996). Informal means of information-gathering are beneficial to scientists in that they are a time-saving means of research. While talking with experts may provide the researcher with ideas and news on forthcoming research, they cannot take the place of scientific literature. Interdisciplinary scientists face several major obstacles when gathering literature, the first of which is a language barrier. Each discipline has it's own terminology and jargon. The more subject areas a scientist spans, the greater the vocabulary needs to be. In addition to mastering the language, the scientist must be able to interpret the literature, which requires an understanding of the history, context of the material and relation to current research (Palmer 1996). Because of the heavy burden of keeping this knowledge at one's command, interdisciplinary scientists tend to rely more heavily on personal contacts for information. To compensate, the interdisciplinary scientist tends to wind up reading less and scanning more (Palmer 1996). Even though we have gathered a small body of research confirming the habits above, we must piece together the rest. Studies show that geoscientists tend to have more frustrations with foreign language materials, and in general tend to be frustrated with end-user searching (Bichteler & Ward 1989). In addition to current literature, geoscientists tend to rely on maps and surveys going back sometimes several hundred years. In many research facilities, geoscientists are now required to have a certain familiarity with GIS (Geographic Information Systems) and other advanced mapping technologies. Physicists tend to rely on conference proceedings, technical reports, dissertations/theses, and newsletters (in addition to journal articles, preprints and informal communication with peers). Oral communication is paramount to physicists in their information-gathering, but the refereed journal article plays a significant role in disseminating new ideas and streamlining the research process (Allen 1991). Engineers are a particular group of scientists who bear their own unique characteristics as well. While engineers are full-fledged members of the scientific research community, their research tends to be overwhelmingly geared toward problem-solving (as opposed to theory and evidence- based research found in other disciplines). This group tends to rely on materials like handbooks, standards, specifications and technical reports. Engineers tend to shy away from the journal literature altogether if they can, preferring to track down other experts to hypothesize on different ways to solve a problem. They tend to interact socially to find documents and people, but avoid doing explicit literature searches (Hertzum & Pejtersen 2000). Health professionals share some of the characteristics of other scientific researchers but with a greater dependence on the journal literature and end-user searching. This group probably bears the heaviest burden of all scientists. A vast amount of knowledge is required of multiple disciplines (biology, chemistry, pharmacology, toxicology, etc.) to research or practice in the health sciences field. Journal literature--especially clinical studies--are more heavily relied upon than personal contacts (Osiobe 1985). Each researcher in one of the "pure" disciplines has their own distinctive way of finding and using information. The primary concern for librarians serving interdisciplinary scientists are the "edges of information"-filling in the gaps for researchers who need to keep current in more than one discipline. A master in one discipline may be completely at a loss as to how to begin research in another area. There are different contacts, databases, journals, and processes, in addition to the language barrier. While many researchers find it useful to network with other researchers in their field, they find it doubly difficult to do this in more than one discipline. The other main barrier to collecting relevant research in more than one discipline is the time factor. The process of searching for information across disciplines is difficult enough. Sorting through that information for relevancy is another project (Palmer 1996). Many times, expanding one's research focus to include cross-disciplinary research requires not only a significant investment in learning new vocabularies, sources and contacts but also a larger investment of time to digest information once one learns where to find it. In order to gain a clearer view of how interdisciplinary scientists are coping with these problems, this research project is aimed at examining the specifics of how interdisciplinary researchers manage their information-gathering. A sample set of interdisciplinary researchers was selected at The U.S. Environmental Protection Agency in Research Triangle Park, North Carolina to participate in a survey. This set of researchers was selected because of the broad representation across various subject areas and sheer volume of interdisciplinary researchers. The primary focus of this research campus is to study the environmental effects of stationary air pollutants. The range of subject specialties amongst researchers includes toxicologists, biochemists, environmental health scientists and biomedical researchers. Due to the nature of the EPA's contract, the survey could not be distributed randomly nor could the author solicit responses from federal employees. Representatives from the largest labs on the EPA campus were asked to select participants for the study. Subscribers to the library's newsletter were also included as participants. A total of 269 researchers were selected to receive the survey. Participants were surveyed on their educational background, the subject area(s) of their current research, how they manage their time in relation to information-gathering and how other issues effect their ability to gather information. Out of the 269 surveys distributed, 149 were completed and returned. The range of subject specialties among respondents was broad, with many respondents indicating that either their current research or educational background involved interdisciplinary study and knowledge of more than one scientific subject area. When asked to identify the primary discipline of their educational background, 63 distinct subject areas were identified. Toxicology (itself interdisciplinary in nature) was the most commonly identified. Biology, Chemical Engineering and Chemistry were also frequently identified as primary educational concentrations. The remainder of the responses was evenly distributed amongst the other 58 disciplines reported, with one or two researchers identifying with each. Approximately half of the subject areas identified by participants were interdisciplinary in nature. In addition to Toxicology, other subject areas such as Neuroscience, Pharmacology, Biostatistics, Environmental Health, and Risk Management were identified. This suggests that approximately 50% of participants did their primary educational work in one of the "pure" disciplines (e.g., Biology, Physics), while the other 50% got their educational training in an interdisciplinary program. Before finishing their educations, these researchers would have had a sizable command of more than one subject discipline before beginning their professional research. Participants in the study were then asked whether their current research required a mastery of more than one subject discipline. Participants overwhelmingly responded that their research required significant knowledge of at least two subject areas. The fields of Health Science, Chemistry and Biology were the most highly identified as being necessary to the participants' current research. 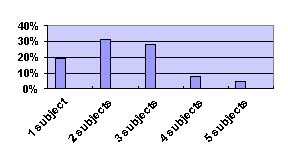 As shown in figure 1 below, most respondents indicated that they had to have an extensive knowledge of at least two subject areas. These results indicate that most of the participants are required to have a sizable knowledge of 1-3 subject areas, with some identifying up to 5 distinct subject specialties. These responses confirm that a large portion of the participants do in fact have to maintain a certain level of knowledge across disciplinary boundaries. Approximately 89% of respondents indicated that they needed to be somewhat or very familiar with the terminology of more than one discipline to understand the literature. (Only 4.5% of respondents indicated that they could interpret the literature of various disciplines without having an in-depth knowledge of the vocabulary of that discipline.) These findings not only confirm previous research (cited in the literature review), but also demonstrate that EPA researchers must master a tremendous amount of resources to conduct their research successfully. Most feel that they need to be familiar with several subject areas as well as possess a sizable vocabulary in several areas just to be able to understand the literature. The next question that leaps forward from these results is "How are the participants managing to keep up?" Respondents were then asked to indicate how many hours he/she spent in a typical week on information-gathering, a wide range of responses was indicated. The bulk of respondents fell within the range of 4-10 hours per week. Figure 2 indicates that the largest portion of respondents identify themselves as spending 10 or more hours per week in information-gathering pursuits, with most reporting spending at least 4 hours in an average week engaged in the same pursuit. This confirms that a significant part of the researcher's daily schedule is devoted to information-gathering. Approximately 85% of the respondents who indicated the amount of time spent in information-gathering reported spending anywhere from 10-25% of this time away from work (in off-hours/personal time). 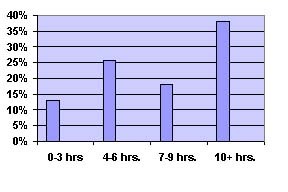 Figure 3 (below) illustrates the fact that most respondents devote some amount of their off-hours to information-gathering for their research at the EPA. While most respondents indicate they perform some of their information-gathering on their own time, only 19% indicated that they achieved all of their information-gathering during work hours. When respondents were asked to indicate how they feel about the time required for information-gathering, approximately 85% indicated that they had at least some trouble keeping up with everything they would like to in regard to gathering research. Only about 11% of respondents indicated having no trouble at all in keeping with everything they'd like. One can conclude that most EPA researchers, regardless of research area, feel that conducting cross-disciplinary and interdisciplinary research makes it difficult to keep up with the current literature. Respondents indicate strongly that there is much more information-gathering to do than they are able, so much so that many are doing as much as 25% of their information-gathering in their off-hours in addition to the research they conduct at the EPA. If one assumes that the lion's share of the researcher's duties are devoted to other important tasks (conducting experiments, attending meetings, management, etc.) it leaves little time during the workweek to seek out relevant research in his/her field(s) of interest. Respondents also indicated that they depended on others to assist them in their information-gathering. Participants were asked to identify who assisted them in their information-gathering and in what capacity. For the most part, respondents indicated that they relied most heavily on support staff. Graduate students and contractors (non-Federal employees working on the EPA site through various contracts) were also cited as being instrumental. These same respondents indicated that they needed to master several subject disciplines and a sizable vocabulary to understand the literature they use. How can others who do not have a mastery of this universe of knowledge assist in information-gathering? Some graduate students and contractors would be able to grasp the research enough to understand the literature, but would they carry the level of expertise needed to do exhaustive searches on complicated scientific issues? Support staff generally do not have the training or expertise to perform literature searches at all (nor is it usually in the individual's job description). The primary way in which researchers use assistance in information-gathering is in the function of photocopying articles found in the library located on the EPA campus (or area libraries). Many respondents to the survey indicated that they used others (such as support staff, graduate students or various contractors) to search for relevant articles, learn about current trends in their field(s) of interest, verify facts and to synthesize scientific information into reports. Approximately 15% of all respondents omitted this question. One can draw from this that at least some of the information-gathering that is integral to keeping current on interdisciplinary research is being carried out by individuals who may or may not have the training to do it successfully. One can hope that the researcher does the bulk of his or her information-gathering (with or without the assistance of librarians) but receives supplementary assistance from support staff. It is unclear from the results of this study the extent to which researchers depend on others to seek out relevant literature. It is clear that interdisciplinary researchers carry a heavy research burden, and many are having difficulty keeping up with the literature despite the increased availability of online databases. The necessity to master an increased vocabulary and research tools combined with a lack of time in the average workweek has caused respondents to do at least some of their information-gathering in their off-hours and depend on support staff, graduate students and contractors to assist in their information-gathering pursuits. It is clear from previous research that interdisciplinary researchers, particularly in the sciences, have developed unique information-gathering habits to seek out relevant research. The results of this survey of interdisciplinary researchers suggests that many are required to possess a significant command of an extensive scientific background, vocabulary and various subject research tools in two or more scientific subject disciplines. Many of the respondents reported having a feeling that there is more information available than they are able to devote time to finding. As a result, many respondents are doing gathering research in their off-hours or depending on others to assist them. Further research would be required to determine the extent to which researchers depend on others and how library services can be tailored to these researchers to alleviate some of the burdens in regard to time, effective literature searching and document delivery. Allen, Robert S. 1991. Physics information and scientific communication: information sources and communication patterns. Science & Technology Libraries 11: 27-38. Bates, Marcia J. 1996. Learning about the information seeking of interdisciplinary scholars and students. Library Trends 45(2): 155-164. ________. 1971. User studies: a review for librarians and information scientists. ERIC Document Reproduction Service No. ED 047 738. Bichteler, J. & Ward, D. 1989. Information-seeking behavior of geoscientists. Special Libraries 80:169-178. Erdmann, Charlotte A. 1990. Improving the Information-gathering skills of engineering students. Engineering Education 80(4): 456-460. Hallmark, Julie. 1994. The effects of technology on the information-seeking behavior of scientists. In: Changing gateways : the impact of technology on geoscience information exchange : proceedings of the 29th Meeting of the Geoscience Information Society, October 24-27, 1994, Seattle, Washington (ed. by Barbara E. Haner and Jim O'Donnell), pp. 51-56. Alexandria, VA: Geoscience Information Society. Hertzum, M. & Pejtersen A. M. 2000. The information-seeking practices of engineers: searching for documents as well as for people. Information Processing and Management 36: 761-778. Hurd, Julie M. 1992. Interdisciplinary research in the sciences: implications for library organization. College & Research Libraries 53: 283-297. Mote, L.J.B. 1962. Reasons for the variations in the information needs of scientists. The Journal of Documentation 18 (4): 169-175. Osiobe, Stephen A. 1985. Use of information resources by health professionals: a review of the literature. Social Science and Medicine 21, 9 (1985) 965-973. Palmer, Carole L. 1996. Information work at the boundaries of science: linking library services to research practices. Library Trends 45 (2):165-191. Pachevsky, Talmon. 1982. Problems of information services with respect to integration of the sciences. Journal of the American Society for Information Science 33(3): 115-123. Pinelli, Thomas E. 1991. The information-seeking habits and practices of engineers. Science & Technology Libraries 11 (3): 5-25. Poland, Jean. 1991. Informal communication among scientists and engineers: a review of the literature. Science & Technology Libraries 11: 61-73. Siess, Judith A. 1982. Information needs and information-gathering behavior of research engineers. Paper presented at the Mid-Year Meeting of the American Society for Information Science (Knoxville, TN, June 1982). Von Seggern, Marilyn. 1995. Scientists, information seeking, and reference services. The Reference Librarian 49/50: 95-104.